Portland, Oregon: where the dream of the '90s is still alive. Where you can put a bird on something and call it art. Where 20-somethings go to retire. What's funny about these stereotypes (thanks to Portlandia) is how very pervasive they have become in our every-day lingo. Friends in my immediate circle reference Portlandia more than any other show, not only because it's funny, but because I think people really identify with it. How many times have you been to a restaurant where they explicitly mark items that are organic, local, farm-raised, etc.? If you're from anywhere on the West Coast, I think you find it fairly often. How many boutique stores have you gone into in the past six months and found sweaters, jewelry, purses, mugs, and art that feature birds? I think no matter where you are in the U.S., this is a fashion theme right now. One of the stereotypes that is pushed in this show is the idea that it's a place for 20-somethings to retire, and that it's a city full of people with no real career ambitions. This is one trend shown in the show that I whole-heartedly disagree with. I actually find this a bit offensive at this point, because I have had the privilege of working with some absolutely amazing organizations and individuals who are more hardworking than anyone I've ever met. If you go to Kiva Oregon right now, you'll see 20 entrepreneurs fundraising for a loan. These are 20 individuals who are either starting or growing a small business -- on their own, of their own volition, because they want to. That little speck of desire led them down a path to work closely with a Trustee and then apply for a Kiva Zip loan. When was the last time you followed a small desire all the way through like that? I know I've never had the faith in myself to pull off something that huge. Some of these business ideas came about organically. Take Maria Garcia, for example, who now owns and operates the catering company, Cocina Cultura. Maria used to work for the Mexican Consulate here in Oregon. On Sundays, she would host brunches for fun; her friends from different parts of Mexico would get together and discuss which cuisine from which part of Mexico they wanted to feature, and then Maria would cook for everyone. She'd just request a small donation -- nothing more -- and cook for the entire group. These brunches became more than just eating; it was an opportunity for friends to exchange stories and cultural practices with each other. From this, Maria's Cocina Cultura was born. To get a proper catering company off the ground, Maria is fundraising a Kiva Zip loan! Other businesses involved well thought-out business plans from scratch. For example, Shaun Winter, who makes Hot Winter Hot Sauce. Shaun worked on a farm in Northern California for many years, learning to work the soil, harvest produce, and care for plants. He has been nurturing these skills for many years, and so when he discovered a rogue pepper -- a pepper different from any other he had encountered -- he decided to cultivate that pepper, and from it started making a hot sauce. He worked closely with his Trustee, MercyCorps Northwest, to design a business plan. 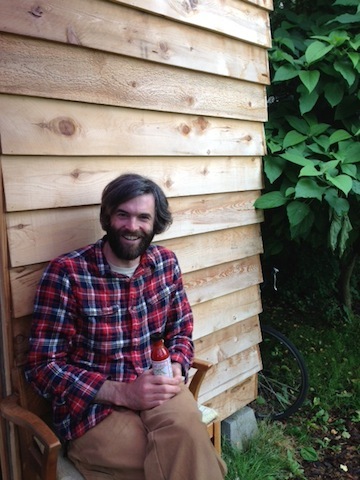 After a year of doing trials in neighborhood and franchised grocery stores around Portland, he was finally able to secure contracts and plan for appropriate supply of his hot sauce, and hopes this Kiva Zip loan will allow him to invest in planting more of his special "Hot Winter" pepper for his Hot Winter Hot Sauce. I don't know about you, but these don't sound like "retirees" to me. Nor do they sound like ambitionless adults, sleeping until 11 and working at a mediocre coffee shop part-time. However, if you'd like to continue quoting Portlandia, I won't blame you one bit. After all, what's funnier than this theme song?